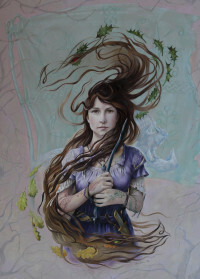 This is my most recent piece of artwork, finished only this morning and entitled ‘Shield Maiden’. It’s the summer solstice and many have gathered for the special day, but typically it’s raining! At last the clouds part and the sun breaks through, and Meredith (the girl in the picture) finally gets her chance to take part in the solstice celebrations. I love contrasts in pictures, hence Meredith’s protector is a fierce (or not so fierce) wolf. All of my work is coloured pencil and it was a challenge to draw rain, wet grass and a rainbow with such a potentially heavy medium. I dug out an old photo of mine of such a rainbow and stormy sky I’d taken years ago, and drew just what I saw. Picture’s often benefit when ‘less says more’, and I first drew the sun just showing through the clouds above Meredith’s head, and then reconsidered and removed it because her expression and eye-line do the job for us, as does the glint on the shield’s rim. Often, it’s what we don’t see that has most impact upon us. This entry was posted in Wildwood - Artwork, Wildwood - Writing and tagged Dark Raven Chronicles, Pencils, Raven's Wand, Steve Hutton, thunder-sprites, witch on May 6, 2018 by Steve Hutton. Coloured Pencils – handy things to know . . .
All of my Wildwood art is drawn in colour pencil, and for those with an interest in this particular medium here’s an article about getting the best from your pencils. First I gather the reference photos I’ll need, ones I’ve taken myself or sourced from elsewhere. Then I visualise how I’ll piece them together. I always use Daler Rowney pastel paper. It has a rough side and a smooth side and I always use smooth. Most of the time I’ll use Platinum: a neutral mid-grey shade. It might sound odd drawing on grey paper but I find that drawing with colour pencil on white paper spoils the effect, as the pigment leaves all the tiny dips and depressions in the paper uncovered and you end up with a kind of ‘white noise’ behind the image that breaks up its solidity. But that’s just me – a lot of CP artists like white paper. Graphite can dirty the colours you lay on top, but to start with I sketch up my image with a 2B pencil, and this can take up to a day as I try out different compositions. Once I’m happy I have a choice – if the colour scheme I’m aiming for is dark then I can draw on top of the graphite (with care) but if it’s bright and breezy then first I’ll ‘dab’ off the graphite drawing with a pencil rubber so that it leaves the faintest of lines. I could of course draw faintly to start with, but that’d mean using a HB or 2H and that can leave ugly scratch marks on the paper. Sometimes I draw out my composition not in graphite but with a colour pencil, that way it’s guaranteed to be absorbed by the overlaying colours. The advantage of this is that there’s no risk of graphite smudging areas of delicate detail, such as a creamy complexion on a child’s face for instance. The down side of sketching with a colour pencil first is that they don’t like being rubbed out! You’re dealing with pigment that’s got oil or wax in, and the rubber can’t always get rid of the lines as it can with graphite – so be warned. If I draw in CP first then invariably I’ll use ‘nougat’ which is a nice subtle brown shade in the Polychromos range. So now the under-drawing’s ready and the colour work can start. I draw a lot of human characters and they can be tricky, so I always start with the face which is the hardest part. If it goes bad then I scrap the picture and haven’t lost too much time. I use a range of colours, finding they all have their strengths and weaknesses . . .
Polychromos by Faber Castelle keep their point well and have good opacity, great for fine detail. Prismacolor (American) mix and blend better than any other brand I’ve come across. They are softer, and so not as good for crisp fine detail. Not easy to source in the UK. Derwent Drawing pencils come in a range of 24 earth/natural colours. They are great for nature studies and their cores are quite wide so good for laying down large areas of expressive colour. Derwent Coloursoft have a wide core and are like Prismacolor in many ways, but I find them a little ‘chalky’ and so I only have a small range, although some of them I wouldn’t do without – cloud blue and brown-black spring to mind. Lastly on the subject of pencils, don’t forget to include a good range of grey shades. I’ll often add a hint of grey to skin tones, sandwiched in between other pigments. Relying on colours alone can give an artificial ‘Disney’ look to a scene. So don’t forget the greys. I rely on my range of French Greys a lot. Accessories: I have a small battery powered rubber that’s very handy if you’ve got to alter a small detail in a crucial place. It’s also great drawing tool in its own right, removing colour rather than laying it down. Pencil extenders – better than throwing 30% of your pencils in the bin! Don’t know why more people don’t use them . . .
Scalpel – always use one for sharpening pencils and for scratching the finest lines in pigment to draw hair or spider silks etc. 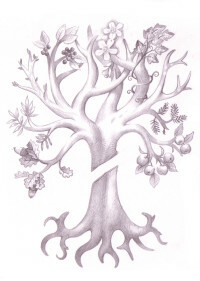 Fixative: I use fix not to protect the drawing, but to get rid of wax-bloom. Once your drawing’s finished you might find it looking ‘dusty’ after a few days and wonder what’s going on. It’s wax-bloom. The oils in the pencils are now seeping to the surface. It’s easy to remove, you can either just fix it to seal it and restore the drawing, or wipe it gently with a soft tissue, and then either fix it or leave it – but the wax might come back. As I tend to work heavy there’s a lot of pigment on my drawings and the bloom can be a problem, so I let them ‘rest’ a few weeks then dust them down and spray them, but never spray too much at any one time as it’ll permanently discolour the drawing! And lastly – tea, plenty of tea . . . This entry was posted in Wildwood - Artwork and tagged Dark Raven Chronicles, Pencils, Raven's Wand, Steve Hutton, witch on March 24, 2017 by Steve Hutton. Imagine you’re a witch, and by this I mean you follow a particular faith and pracitse magic to some degree, in the understanding that ‘magic’ is simply holding reverence for the Earth. You might find it hard to believe that this simple lifestyle rouses the intense hatred and fury of an organisation known as The Illuminata Knighthood. They openly denounce magic and magical practitioners as evil and persecute them, while covertly they confiscate any and all magical knowledge and twist it to suit their aims. To this end, they crush all sympathies and allegiance with magic amongst commoners and witches alike, using brutal and merciless tactics, whether in a so-called ‘courts of law’, or on the battlefield. If you were one of those people deemed a target by this organisation, you might wake up one day in your small rustic coven, hidden in the woods or some other remote place, to find an army of giant metal war machines bearing down upon you. These are The Illuminata’s Krakens. You can either run for your life as your home is demolished, or stand and fight, but considering true magic is the essence of revering the Earth, there is potentially little you can do against tons of iron and steel, bullets and flaming jets of fire. Chances are you would run – and run straight into the waiting arms of the massed infantry encircling the coven. You are vastly outnumbered and pitted against professional fighting men who have a taste for their work. Resist and you’ll be shot, and perhaps that’s for the best, as captured witches are taken for ‘correctional blessing’. Another coven is destroyed and more esoteric knowledge is confiscated and vanished from history. All in a day’s work for The Illuminata. 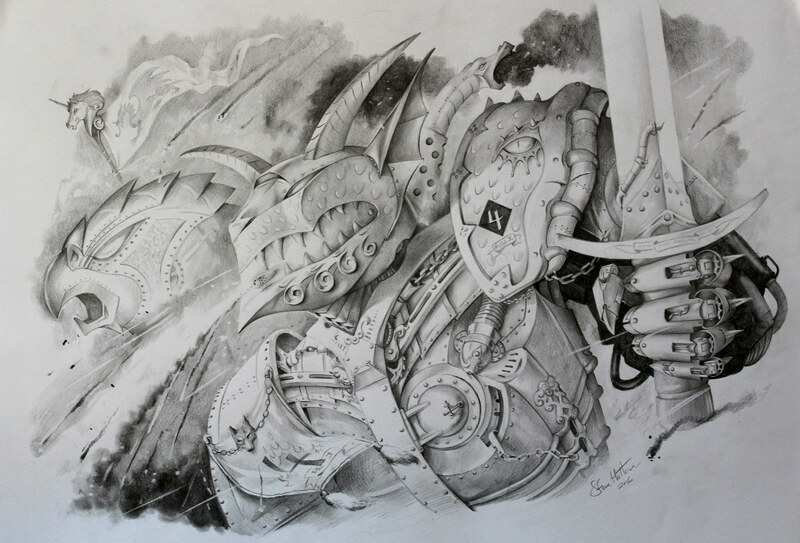 I drew upon my memories of illustrating for Games Workshop (long ago!) to produce this new artwork of Krakens. Against covens, they prove a highly effective psychological weapon, but as The Illuminata bloodlines are constantly warring amongst themselves, they’re also effective in crushing rival infantry, and even enemy Knights. The Illuminata’s roots reach almost as far back as witches themselves, and are equally steeped in magic, although of the malevolent deviser kind. Krakens themselves hint at these deep roots. They are not named for monstrous sea creatures as you might suppose, but for Krakon, the god of war worshipped by outlawed cults in antediluvian Atlantis. Ironic then that Atlantis was devoured by the sea, and the name Krakon became synonymous with a monster of the depths. But Kraken regiments and their arrogant Knights don’t have it all their own way. Sometimes they enter the field with banners flying high, but leave it as scrap metal. This is almost always when confronting enemy Knights, but on very exceptional occasions a regiment of those Krakens swagger into one of those small rustic covens only to be destroyed as surely as Atlantis itself, as Valonia will happily tell you . . . This entry was posted in Wildwood - Artwork, Wildwood - Writing and tagged Dark Raven, kraken, magic, witch on May 28, 2016 by Steve Hutton. Fairies don’t see the world as we do, at least not those fairies that dwell in The Dark Raven Chronicles. When frost-fairy Neet, meets witch Sunday Flowers for the first time, he’s entranced by her soul sign. This mystical representation of the soul takes the form of a tree, and floats above the crown of the head. Some of the branches might be bare, while others are in bud, or laden with fruit or flowers, and these branches might sit right beside others that are twisted and diseased. The branches represent all that’s good and bad about a person. Neet can see this, but Sunday, for all her skills as a witch, can’t. Neet’s seen many soul-signs down the years, and although he understands little of the symbolism he instantly recognises that Sunday’s soul is unique – terrifyingly so. All other trees he’s seen are complete, yet Sunday’s tree has been cut clean through the trunk. Somehow she has defied the first and oldest universal law – she has died, and returned to life. Flowers of Fate is the second novel in The Dark Raven Chronicles, and aside from being what I hope is an exciting story, it explores deep issues such as freewill versus fate, atonement and self-sacrifice. I look forward to sharing Flowers of Fate with readers later this year. 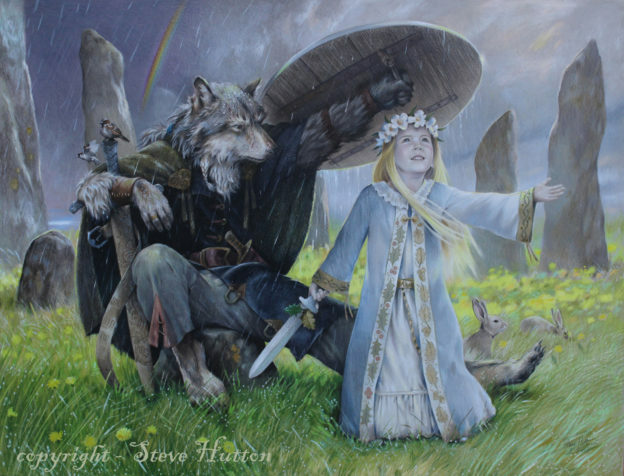 This entry was posted in Uncategorized, Wildwood - Artwork, Wildwood - Writing and tagged Dark Raven Chronicles, magic, Steve Hutton, Wildwood, witch on May 5, 2016 by Steve Hutton. Reworking the cover for Raven’s Wand, the first of the Wildwood books, I brought Kolfinnia to the fore. Book covers demand an eye-catching and appealing image for obvious reasons, but I didn’t want Kolfinnia (the story’s young hero) reduced simply to cover decoration. She’s a young woman with a serious duty, she’s been through a lot and has a lot more to get through before the book’s over. I hope she’s beautiful (and beauty’s a wildly subjective topic!) and if she is, then I hope it’s because of what’s inside her. Look into her eyes – there’s focus and resolve there. She’s strong, but not in a macho-aggressive way that some writers portray female leads, but rather it’s her sense of compassion and justice that enable her to face the challenges ahead. I wanted to keep the focus on her face and what she’s feeling. Look long enough, and the surrounding details begin to melt away and only Kolfinnia’s steady gaze remains. Before you know it you’re looking at a real person, not just a pleasing face to brighten a book cover, and it’s her conviction that helps make a fantasy story seem more like a story rooted in fact. Neither did I want any trace of voyeurism. Sorry – but nobody goes into action in high heels and a bikini outside of the realm of Hollywood. 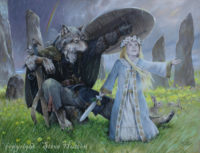 This entry was posted in Wildwood - Artwork, Wildwood - Writing and tagged Dark Raven Chronicles, Illuminata, Kolfinnia, magic, Steve Hutton, witch on February 15, 2016 by Steve Hutton. The most intriguing character of all the Wildwood novels never speaks and isn’t really alive, at least not in the way we’d understand, yet it’s always there in the background, guiding our way like a compass needle. We might even come to take it for granted in the same way we seldom question the ground beneath our feet, but that’s only proof of its reliability. During the trilogy of books the spotlight shifts from character to character. Kolfinnia might take centre stage in book 1, but then the focus moves onto other characters (can’t say without giving the plot away!) and back to the familiar faces we began with. If asked, I’d struggle to name one character that’s a key player in all three books other than this mysterious and often mute ‘compass needle’. I speak of course of Valonia’s wand – hrafn-dimmu, or Dark Raven if you prefer its English name. The wand is passed from keeper to keeper through the books like a baton and you can be sure that wherever it is the action’s not far behind. Dark Raven is a constant, much like its flesh and blood counterparts. 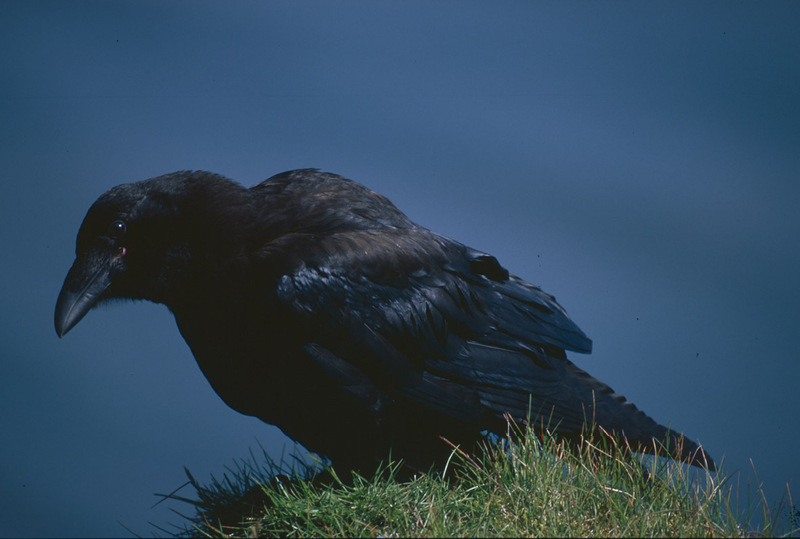 Raven’s have featured in folklore and mythology for as long as people have walked the Earth. We’re fascinated by their keen intelligence, and often resent it. We heap macabre reputations upon them for their love of carrion, forgetting who it was that littered the battlefields with bodies in the first place. Their indigo-black plumage reminds us of the dark, and how we still fear it. But Valonia’s wand isn’t named for any of these qualities. My lasting memory of ravens – real ravens that is – if of their always being there. Just like Valonia’s wand, they’re a constant. Hiking through the Arctic you begin to feel like the last person on Earth. You begin to wonder at the sheer brutality of the landscape, and how could anything scrape a living here. And then you hear a raven’s call ring out. You look up and see not one but two, gliding and tumbling without a care, as if this desolation was Eden itself, and suddenly there’s another heartbeat in this rocky nothingness and you smile to yourself, knowing that you’re not alone. Raven’s pair for life and live many years. Their acrobatics and vocal range are incredible. Stay put long enough and they’ll come to investigate, and you know you’re being scanned with eyes that are almost unearthly. Call out to them as their soar overhead, and if you’re lucky they’ll reply with a sound not unlike a tuneful ‘gulp’, and a dip of their wings. But I’m under no romantic delusions. Years ago I saw a raven carry off a black-back gull’s chick with the parent in hot pursuit. Life is harsh. You might be snatched from the nest and devoured at just a day old. It’s tempting to see animals as symbols of wisdom, indeed many people who accept that they have a spirit guide name the raven as their protector. The same goes for wolves, bears and eagles (I’ve yet to meet someone who’s spirit guide is a rabbit or a goldfish). I also know that if I died in those frozen wastes, those ravens would be on my carcass in a shot, probably bickering over who gets the tastiest eyeball. It’s that honesty that I admire. Nature is often hard but it’s always honest. Unlike people, you always know where you stand with animals, and when it came to picking a name for Valonia’s wand I had this honesty and reliability in mind. Ravens I salute you! And if I keel over in those barren wastes one day and go to that great tent in the sky, I can’t think of a better use for my bedraggled body than to raise the next generation of dark ravens. This entry was posted in Wildwood - Writing and tagged Dark Raven, Dark Raven Chronicles, Steve Hutton, witch on January 21, 2016 by Steve Hutton.